Make sure the left and right sides match when repairing wheel arch profiles, bodywork contours, or forming your own panels. 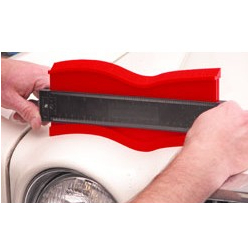 This profile gauge features over 16 nylon blades per inch to assure faithful reproduction of even the finest details. Magnetic backing provides convenient storage and positioning for creating a metal pattern. Interconnects with another profile gauge to create an even wider pattern.